Directions: Erawan Shrine is a popular shrine in Bangkok, located right on the Grand Hyatt Erawan Hotel, in the Ratchaprasong Shopping District, directly on one side of the intersection between Ploenchit ann Ratchadamri Road. 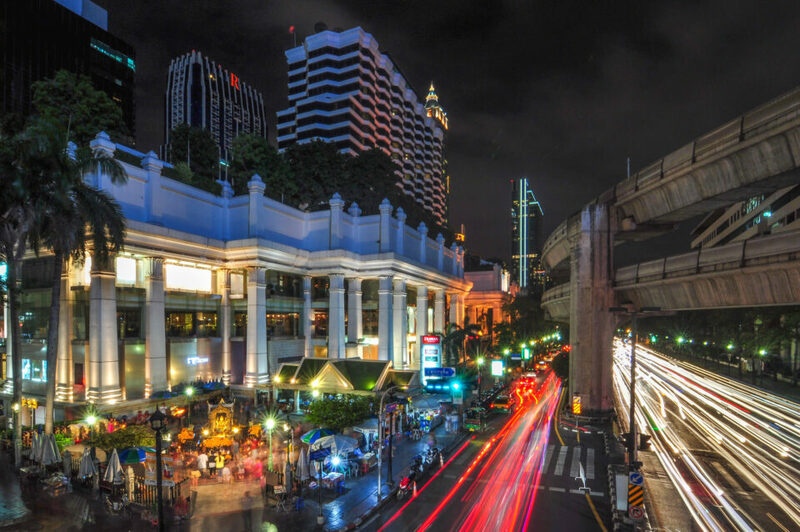 It is easily visible from the elevated pedestrian path near the Chitlom BTS Station. Erawan Shrine is open from early morning until midnight, and is easily a spot for people, especially pedestrians, to stop for a moment and pray. There are times in which the shrine is heavily visited, especially after sunset. 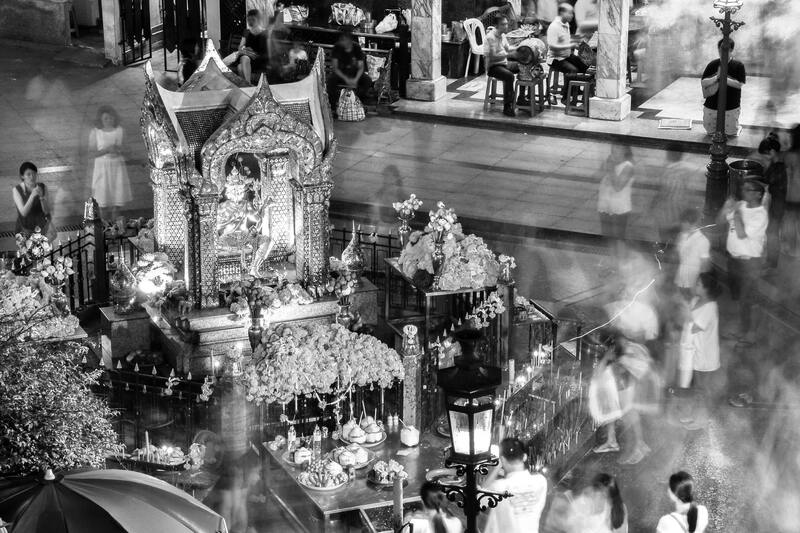 That particular time is when Erawan Shrine would be a nice photo spot. 1. There are unlimited possibilities of angle to freeze the activities into a nice picture. You could be inside the shrine’s area, or even outside, and my favorite spot is outside, particularly on the elevated pedestrian path. By standing on that location, I will never bother their activities with me trying to take their pictures. 2. People movements are the main subject and focal point of the shrine. Try to find out some special occasions and there would be more people and there would be better opportunity in capturing those movements. 3. Because the shrine is right on the side of a hectic intersection, combining it with some traffic light trails could be a good idea for a more creative shots. 4. Multiple exposure is recommended to combine more movements, whether it is the people movements or the light trails of the traffic (which regret I didn’t do because of some situations back then). 1. Telephoto lens (I only had “guilty pleasure” lens back then). This lens is best used when you shoot from the elevated pedestrian path. 2. Wide angle lens for amazing traffic light trail pictures.